Sheeba is doing well! It's taking her some time (and an escape! ), but she seems to love it here! Because of her background, I'm assuming that's why she is so skittish... but after she circles the backyard once or twice she's OK w/everyone. She even loves my cats (but they sure don't love her! ), loves to play w/them through the screen door! I spend as much time as I can w/her and walk her a lot, and boy does she love to walk! 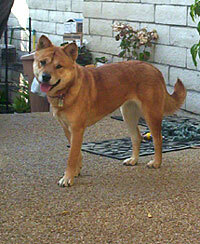 She also loves other dogs, but doesn't get along w/my brothers Akita, actually no other dog gets along w/the Akita! Oh well! She is a beautiful dog... I'm glad that I gave her a chance. She's a great addition to my pet family and I love her to death! Thank you very much!